Most amniote reptiles' genders are determined by the temperature of the ground in which their eggs incubate. A breeder, therefore, can manipulate eggs' incubation temperature to deliberately cause developing embryos to become either males or females. Otherwise, a breeder will have to wait three to five years before seeing the development of secondary sexual characteristics. Once slider turtles are mature, their toenails and tails provide positive identification of gender. Size, and shell shape, may offer clues as well. A veterinarian can perform an endoscopic examination of a turtle’s cloaca by using a small camera on a flexible stalk. Visualization of the turtle’s gonads will positively identify the creature as a male or female. Because pet owners can avoid this expensive and invasive procedure by simply waiting for other characteristics to appear, this is rarely done on pet turtles. Male slider turtles have longer and thicker tails than females do. Males' vents are located closer to the tails' tips than they are in females. Males' vents are outside their shells' edges; females' vents are located inside their shells' margins. The adaptation -- extra length and girth -- accommodates the males' penises, which reside inverted, inside their cloacae. Males evert their penises only during mating activities. 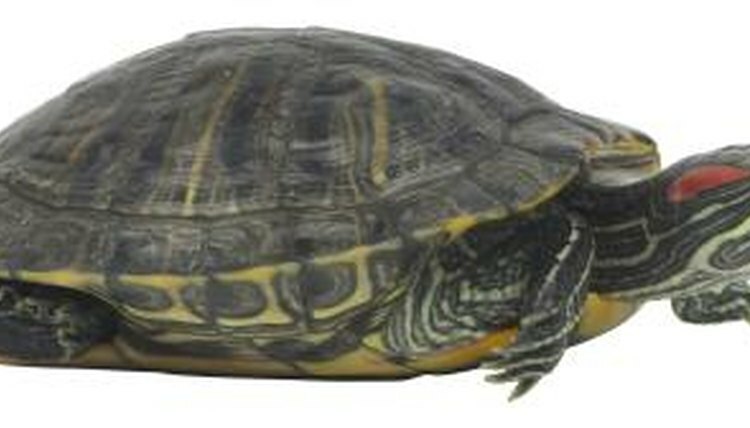 Relative to females', male slider turtles have very long toenails. Courting males use their fingernails to tickle and stimulate females' faces. Juvenile and female sliders exhibit this behavior at times, so the act is not entirely indicative of gender. Once the female is receptive to his advances, a male will use the fingernails to help cling to the female's shell. Size is not definitively indicative of a turtle’s gender, but it can provide a clue. Slider turtles females mature at greater size than males. While male slider turtles mature at about 4 inches in plastron length, females mature at 5 to 7 inches. Males may eventually attain 8 inches, but the largest slider turtles are invariably female. Exceptionally large female sliders may exceed 13 inches in length. Older males often exhibit concave plastrons. Scientists hypothesize that this adaptation provides the males with more stability during mating -- the concave surface fits well with the convex surface of the female’s carapace.